Nashik is the new Goa, this season. The lush green Sula Vineyards, perched atop the rolling hills of Nashik, is turning the river town into a venue for a three-day world music and gourmet festival starting today (ending Sunday). With the best of wines and spirits from around the world ai??i?? including tequila, sambuca, bourbon to cold pressed juices, perhaps one will not miss the Goan beaches. 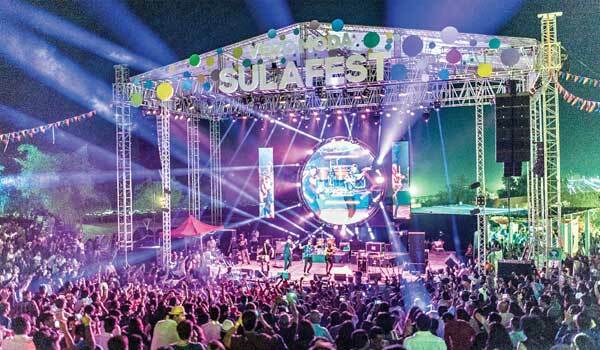 As SulaFest completes 10 years this edition, the milestone outing will be celebrated across three days, as opposed to its two-day festival every year. Cecilia Oldne, global brand ambassador and Vice-President ai??i?? Marketing, Sula, says, ai?? ?I remember our first edition with four bands and 300 people. Weai??i? ?ve come a long way since then. This year we expect 15,000 people. The health enthusiast in me is pretty excited about the introduction of sunrise yoga sessions and even a morning runai???. The likes of the Bombay Food Truck, Busago, Mainland China, Maroosh and Woodside Inn from Mumbai and others will serve up great food to go with the wide selection of wine and drinks. The festival has US-based Hershey Premium chocolate ai???Brooksideai??i?? on board this year. Chocoholics must try their exotic flavours ai??i?? pomegranate, raspberry & goji, and blueberry and aAi??aAi??. Along with the Sula Selections portfolio, one can expect to try wines from Bouchard AAi??nAi?? & Fils, Le Grand Noir, Cono Sur. Mud House, Kumala and Hardys besides meeting wine legend Robert Joseph for a chat. Besides red, white and rosAi?? flavours wines from Sula, the fest will line up Hardys from Australia, Trapiche from Argentina and Kumala from South Africa. There will be more than 40 wines apart from healthy juices from Mumbaiai??i? ?s RAW Pressery. Expect to listen to 30 genres from around the globe ai??i?? from world fusion to electro, acoustic, techno, house, pop, electronica, electro-swing and witness over 150 artists, ranging from UK, Italy, Bosnia, Israel, India and more across its three stages. Among the performing artistes are Bloc Party (UK), Infected Mushroom (IS), Afro Celt Sound System (UK), Indian Ocean (IN), Ska Vengers and others. ai?? ?Our singer Kele writes the set list just before we perform, usually. As it is our first time in India, there will be a mix of songs from each of our albums. Personally, Iai??i? ?m always keen to throw in a few surprises,ai??? says Russell Lissack, lead guitarist. He adds, ai?? ?As a band, we have always looked to try new things based on what is inspiring us at that time.ai??? Block Party will perform on Sunday (February 5). One of the earliest proponents of the now-popular genre of dubstep in India, Nucleyaai??i? ?s signature music is Indian in nature, but international in appeal. ai?? ?This year, my fans can expect to hear all of the tracks from the latest album Raja Baja and also a few favourites from Bass Rani and Koocha Monster. What can we expect from the band which averages 120 live annual performances around the world? ai?? ?Our set at the SulaFest will be more psychedelic than our usual sets. Lots of old-school sounds, and stuff from our new album, Return To The Sauce, which is more of a pure Psy-Trance LP. We have also been busy launching our line of effect plug-ins, such as ai???iWishai??i? ?, ai???Pusherai??i?? and ai???Manipulator,ai??i?? says band member Amit Duvdevani. The band will perform on Saturday (February 5).